Information overload is a hot topic these days. I’ve really enjoyed recent essays by Aaron Saenz (“Are We Too Plugged In? Distracted vs. Enhanced Minds”), Michael Sacasas (“Technology Sabbaths and Other Strategies for the Digitized World“), and Peggy Noonan (“Information Overload is Nothing New“) discussing this concern in a thoughtful way. Thoughtful discussion about this issue is sometimes hard to find because, as I’ve noted here before, information overload is a subject that bitterly divides Internet optimists and pessimists. The pessimists tend to overplay the issue and discuss it in apocalyptic terms. The optimists, by contrast, often dismiss the concern out of hand. Certainly there must be some reasonable middle ground on this issue, no? That very much reflects my own position on this issue, even if I tend to lean a bit more in the “pragmatic optimist” direction whereas Powers is more of a pragmatic pessimist. Nonetheless, my own struggle with information overload and gadget addiction continues. As I have written here before in essays like, “Can Humans Cope with Information Overload?” I’ve been formulating a variety of strategies to cope and find the right balance. For me, the most successful strategy is what I refer to as “mini sabbaticals.” I try “unplugging” for short spells each day (turning off email & phone, close web browsers, and just generally get away from my computer and other gadgets). Usually I’m offline for an hour in morning and then also in afternoon, and then a couple hours offline during evening. My wife and kids certainly appreciate it! But it also helps me spend more “quality time” with books, writing, and other pursuits. And I’ve even started telling people not to expect a quick response from me when they call or write. When I tell people this face-to-face, their reaction is often one of puzzlement, and in some cases even offense. I suppose some of them imagine I’m just saying this to avoid them (which may be the case!) But I try to stick with the rule and avoid gadgets and connections for little spurts each day and it has been terrifically beneficial for me thus far. I am able to read even more than I used to and can focus on getting other things done that are important. Earlier this summer, I went even further. During a week-long vacation in Germany, I decided to take day-long digital sabbaticals, only checking emails, Twitter, and RSS feeds after 10:00 at night, if at all. It was terrifically refreshing. Simply not having to carry a smartphone with me all day long was a huge relief. But ignoring email for days at a time was wonderful too. Of course, things had really piled up upon my return to the States. But that’s another thing I’ve learned to do to cope: Hit that delete button a little more frequently! Do I really need to read through the hundreds of emails I get each day? No, not really. Neither do you, I bet. In Hamlet’s BlackBerry, Powers offers some possible solutions of his own, but they are generally in the form of practical advice about how to lead a good life. “The best solutions serve as a kind of bridge to the tech future, one that ensures that we’ll arrive with our sanity intact.” (p. 155) To find those solutions, he draws upon the wisdom of the ages from figures as diverse as Plato, Aristotle, Seneca, Shakespeare, Ben Franklin, Thoreau, and Marshall McLuhan. For example, from Thoreau he borrows the notion of finding or creating “a zone of inner simplicity and peace” to create “Walden time” or “Walden zones.” This could take the form of daily digital sabbaticals, or an area of the home that is free of technology at all times. I already use variants of this rule in my own home. Many years ago, my wife and I instituted “Media-Free Mondays” in our house so that the kids understand at least one night every week will be free of TVs, computers, video games, etc. We use the time to play board games, do arts and crafts, or play outside more. In other words, Mondays are the Thierer family’s “Walden Zone.” Again, every family could come up with their own variant of the Walden Zone rule to fit their needs. At the end of his book, Powers says that his family unplugs their modem each Friday night at bedtime and doesn’t turn it back on until Monday morning — a weekend “Internet Sabbath,” he calls it. That seems a bit extreme to me but, again, to each his own. I should be clear that I am not quite as pessimistic as Powers about the impact of technology on humans. I’m not persuaded by his argument that information overload is having as deleterious of an impact on creative thinking and that “the best human creativity… happens only when we have the time and the mental space to take a new thought and follow it wherever it leads.” And I think he goes much too far when he makes pronouncements such as “We’re living less and giving less, and the world is the worse for it.” (p. 210, italics in original.) In both cases, I think there are plenty of counter-examples and positive trends that can be cited that prove such sweeping generalities are off the mark. Yes, it’s certainly true that many people are struggling from data deluge and that it has complicated their lives in many ways. But the presence of these new tools and the rise of information abundance have alleviated many of the problems that previous generations lamented. Indeed, for many centuries the primary problem we humans have faced was information poverty. We were starving for informational inputs. That problems has been largely alleviated and instead replaced by concerns about information overload. But my point is always a simple one: Isn’t abundance a better dilemma for society to face than scarcity? As I told Gordon Crovitz of the Wall Street Journal recently, I’ll take information overload over information poverty any day! Nonetheless, the struggle with information clutter will continue. 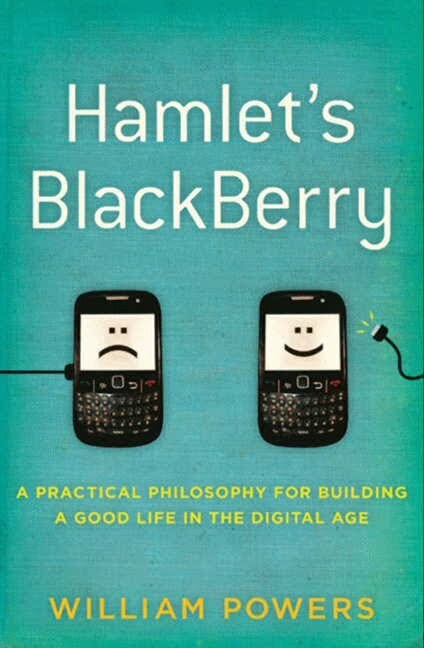 Assimilating new communications and entertainment technologies into our lives has always been challenging, but, thanks to excellent advice like that offer by William Powers in Hamlet’s BlackBerry, I am optimistic that we humans can do so sensibly and be happier — and wiser — for it in the long-run. my essays on “Internet Optimists vs. Pessimists,” an earlier piece on information overload, and my reviews of related books on this subject by Carr, Lanier, Siegel, Keen, Helprin, Baron, and Shirky.